It is such an intriguing plant, purslane. For one, it is everywhere, in many countries, from the sidewalk cracks in the cities, to your vegetable garden, likely where you don’t want it to be. It is so hearty and can withstand most circumstances. The leaves are fleshy, a little salty, a little sour, a kind of built in “vinaigrette” flavor, requiring little else to make it into a salad. But what my grandmother likes about it most is its nutritional attributes. It has an extraordinary amount of Omega-3 fatty acid, which is normally found in fish and flax seeds. It also contains vitamin A, C, B, as well as magnesium, calcium, potassium, and iron. It also has something called “alkaloid pigments” which is indicated by its reddish stems and yellow flowers. These are potent antioxidants. 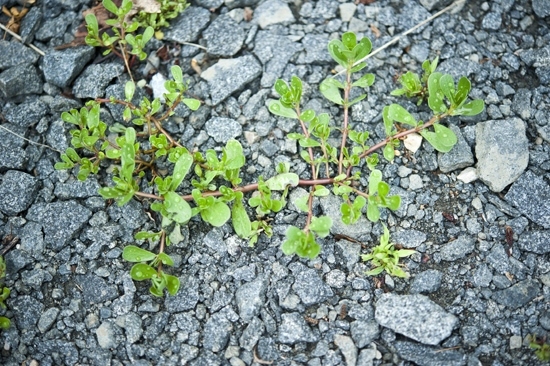 Here is what purslane looks like in one of its chosen environments: a gravel parking lot. See? It’s perfectly content where no other plant is. And here! In the black weed preventing strip in my garden where the vegetables are supposed to grow without competition from weeds. Clearly the purslane didn’t get the memo. 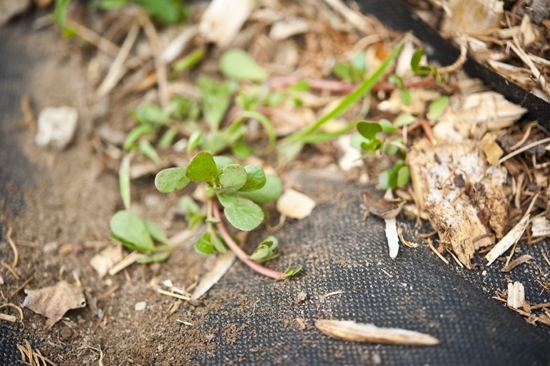 And even in the driest conditions… purslane perseveres. If you see it, pick it. It makes a wonderful salad. I ran to the garden last night and whipped this up for dinner and it was so very tasty. 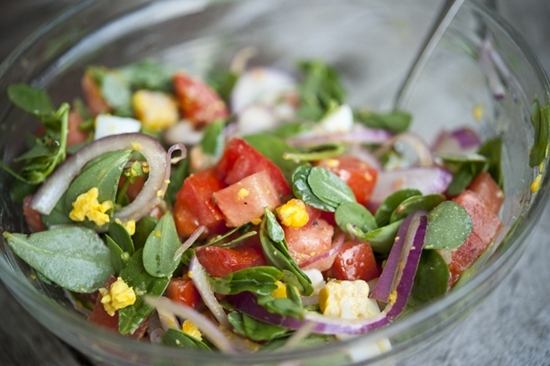 I had made a simple purslane salad a few summers ago, but this one I wanted to doctor up a bit more. I was feeling colorful. And there were some fresh eggs from the chicken coop that needed tasting. 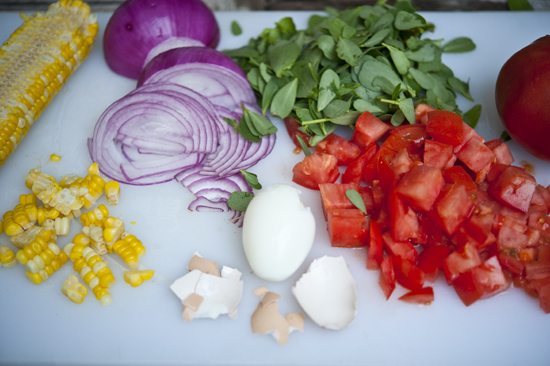 This was the cast of characters: corn kernels (fresh or cooked), thinly sliced red onion, hard boiled egg, diced tomato, and a heaping pile of purslane leaves, washed. You can also eat the purslane leaves and flowers if you so desire. They are for the slightly more adventurous crowd, and my dinner table companions weren’t perhaps ready for that. But the leaves have a wonderful tangy flavor. Which means you don’t even need vinegar. Dice some tomatoes into small pieces. Some colorful heirloom tomatoes would be nice here as well. 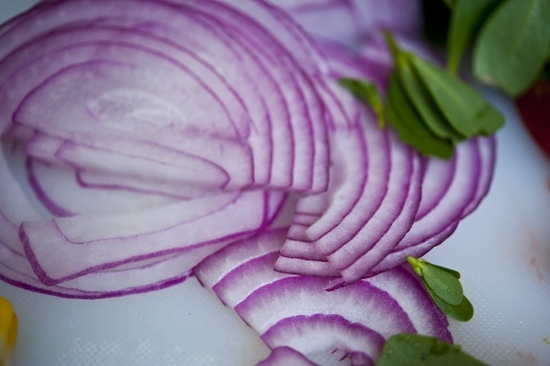 Thinly slice some red onion. White onion would also be tasty. In fact, that is what I use for my other purslane recipe. 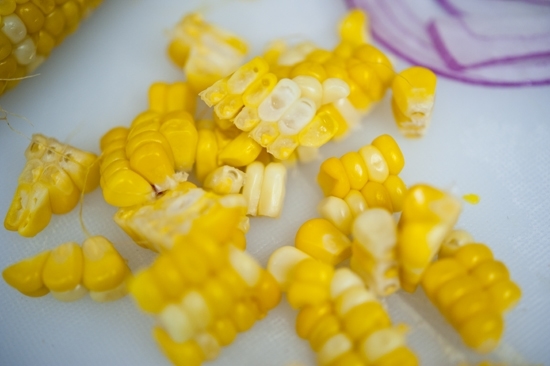 Cut some fresh corn off of the cob. I prefer my corn raw, something else I inherited from Grandma Pellegrini. She gave me a whole speech yesterday about how she used to go pick up a bag of corn from the farm stand, then shuck a piece and eat it raw on her drive home. Some things never leave the DNA. 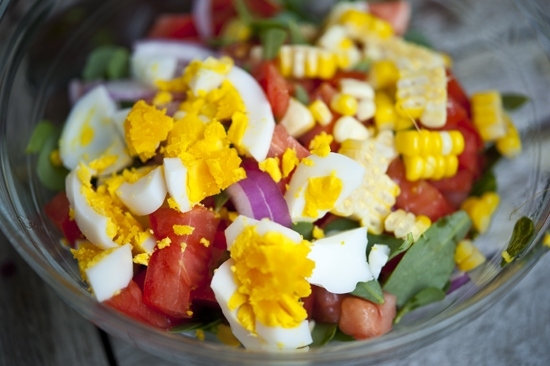 Hard boiled egg makes this salad for me. 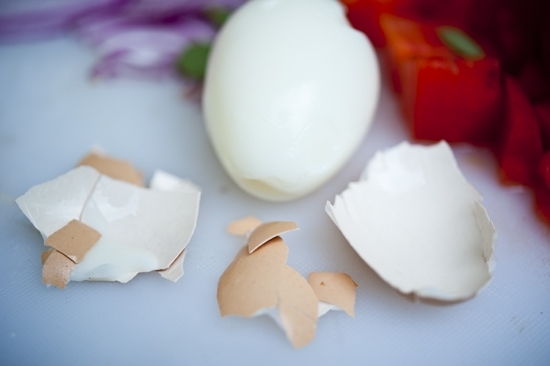 I just love hard boiled egg in my salads. This one has an especially bright orange yolk which looked pretty in the dish. Add a little sea salt. 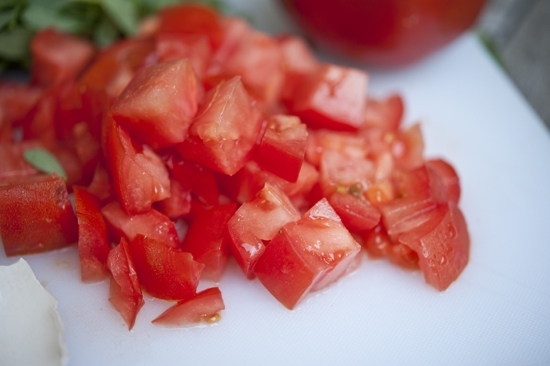 This will help release the juices of the tomato and will add to the “dressing” of the salad. Also add a little freshly ground pepper for some spice. Then, to give it a third dimension I added some nutty oil. You can use your favorite finishing oil, including a high quality extra virgin olive oil. All you need is a touch. And there you have it! 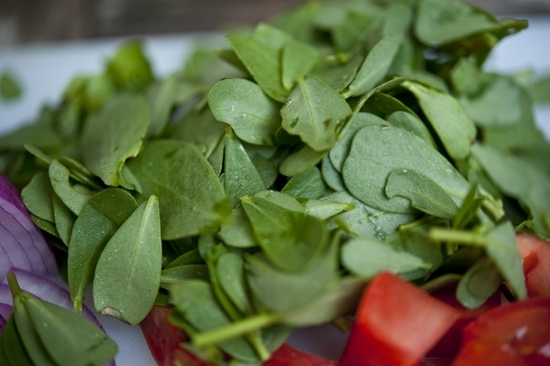 If you come across some purslane (it’s in almost every farmers market now) give this a try. There are so many wonderful variations you could dream up. 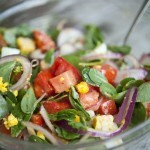 Here is my other, simpler Purslane Salad Recipe. Combine all of the vegetables in a bowl. 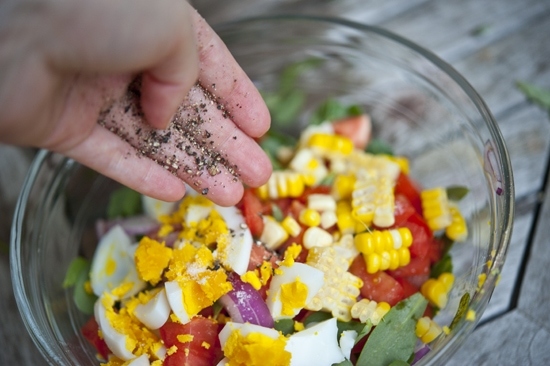 Sprinkle with salt and pepper and toss to mix. 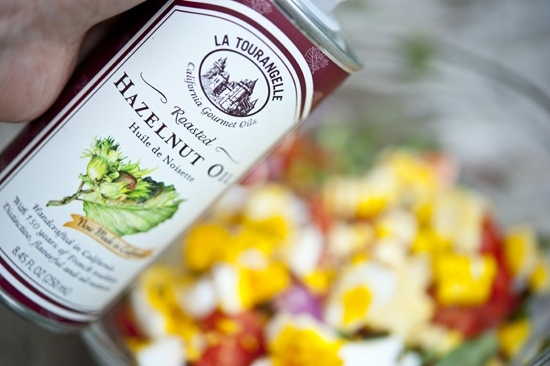 Drizzle in the hazelnut oil and toss again to distribute. Serve! Look at that feisty green. LOVE that it thrives everywhere. Dang that grandma P has great taste…as do you. Need to go out and forage the sidewalk now!! This post is just beautiful. So many gorgeous natural colors. The recipe looks terrific too. 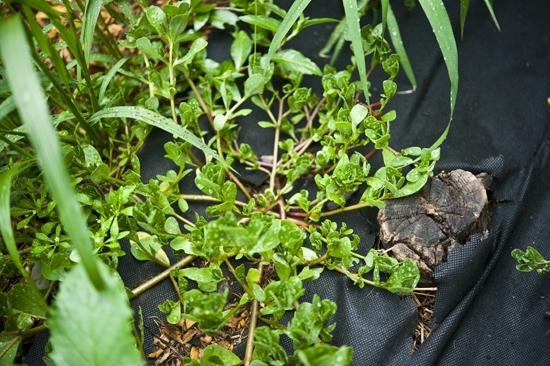 I love purslane, but I don’t have a garden and often forget about it. I bet the farmer’s markets have it now though. Thanks for sharing. I had no clue! !……..I probably have this all over the place!! lol thanks for the insight and recipe Georgia! I had no idea that you could eat that! I have some in my garden right now, I just thought it was pretty!! I am feeling a little silly that I have never even heard of purslane! I wonder if it grows in my region? I will have to start looking at the nooks and cranny’s of my garden more carefully! Thanks for the info- it clearly makes a beautiful salad! Wow. I just love the colors in this salad. Yum! I’ve never heard of purslane before but I can’t wait to go explore my yard. We live in the downtown area of our little city which means no homeowner’s associations…which means a nice variety of plants grow in our yards. I bet there’s gonna be some purslane here. I can’t wait to get some of those wholesome omega-3s!!! What an interesting grandmother you have. How wonderful that she gives you so much wonderful nutritional advice! I grow purslane…like…on purpose, from seed. Wish it was a weed around here, it’s darn tasty, and an appreciated heat-loving green thing for salads. Wow, this looks so good, I love strong tangy flavors, so I know I would love this. I’ll have to be on the lookout. 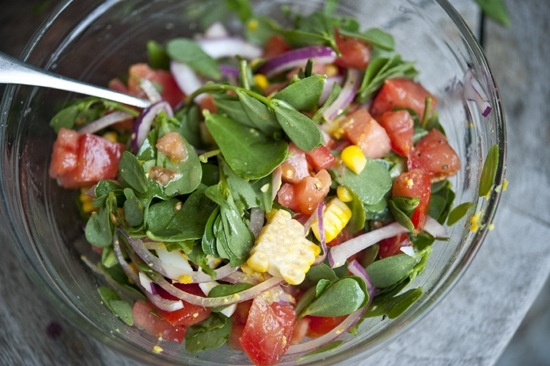 Ever since I read this post I’ve been a purslane fanatic! Believe it or not, I found some (finally) in the parking lot at Whole Foods!! Using the assumption that they probably think it’s a weed, I did a nice little thing and pulled that purslane from their sidewalk…roots and all. I quickly transplanted that little weed into my yard and I’m happy to report that I have a nice supply of Omega 3s growing in my own yard. 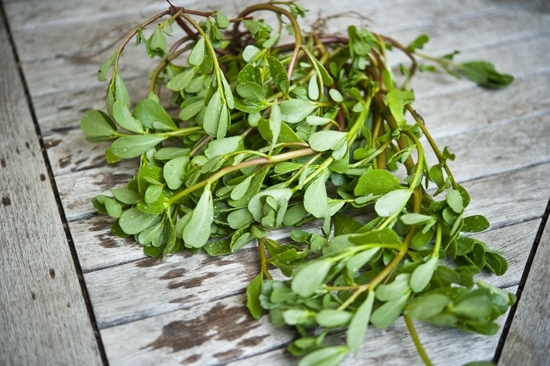 By the way, I believe Dr. Oz recently included purslane as a super food or something like that. You’ve started a trend! That’s so cool Marly! That makes me so happy to hear that. I think it’s so hilarious and awesome that you found it in the parking lot of Whole Foods of all places. I’m thrilled you transplanted it too and it’s growing. I love the tangyness of it in a salad so much. I also love boiled eggs in a salad. Purslane grows all around where I live, so I’ll try it. It would be great if we could also find a use for wild morning glory! Oh well, guess I’ll dream on. I’ll think about the morning glory while you eat the purslane! 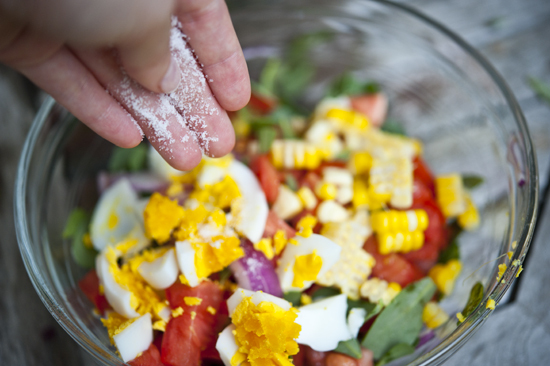 I love boiled egg in salads too, mmm. I simply adored this story of your grandmother and her wise ways and the photos jump off the screen with all those crisp and colorful ingredients. Time to transplants some of these precious weeds from my clients front yard into one of my vegetable beds. Good idea! I hope it works for you. I love it. 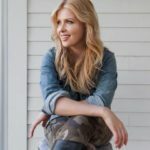 My friend told me that she had seen this recipe you had so I looked it up. I have been pulling this stuff out of my yard for a couple of months now. It seems to love to grow in my grass. I finally checked to see what this annoying weed was and now I find I need to go pick and and use in salads. Thanks for your information and recipe. i AM going to try it soon. Great! You will love it and it is so good for you. More Omega 3s than salmon. These grow like crazy once you have them. I saved the seeds from those that were flowering. Now They grow everywhere. I actually can Enjoy a seedling salad. If i dont pull them, They will choke my plants and herbs.